Here's something that surprised me: I think the contestants in this season's American Idol may be the best group assembled in any season. The voting part of the season is just starting, so if you start tuning in now, I think you'll get some very good singers and some smart, helpful judges. I knew from the start that it wasn't the manner of writing -- it wasn't the style, no matter how quirky or clever it was. I was especially certain that it wasn't figured language -- metaphors, similes -- and it wasn't some kind of "meaning" hidden behind symbols. Those had absolutely nothing to do with the way the best stories work on readers -- they were, I concluded, simply a thing that literature teachers can talk about to fill up class time, because they had no more idea of what made good stories good than I did, starting out. One of the first to affect me that way was Mark Twain's The Prince and the Pauper. To me, the world of that story was simply England, and I became a lifelong anglophile. This was before my parents bought the World Book Encyclopedia. The only general reference book we had was a one-volume encyclopedia, printed in tiny type on paper reminiscent of the thin stock they use for printing Biblees. But I searched that book for hours, finding out the names and reigns of every monarch of England, because the book had no listing for "monarchs of England." I'm sure a trip to a library would have got me a book that listed everybody. But instead, I had to winkle every name from separate entries in that single volume, following up each "see also" reference. There were other books from my childhood -- Little Women, Little Men, Gone with the Wind, Pride and Prejudice. Then Screwtape Letters, my introduction to C.S. Lewis and still my favorite of his fictional works. There were history books that captured me in exactly the same way as my favorite fictions: Bruce Catton's trilogy The Army of the Potomac, William Shirer's The Rise and Fall of the Third Reich. If you know that in my career I've been best known for science fiction, you may notice something missing from this listing. That's right -- I wasn't an avid reader of science fiction. It wasn't until eighth grade that I finally plunged into sci-fi with Andre Norton and Robert A. Heinlein. With both of them, I learned that just because I love some books by a writer it doesn't mean I'll like everything. Heinlein lost my interest with Starman Jones, and I never read Starship Troopers. Likewise, Andre Norton lost me with the Witch World novels. Sci-fi was never a major part of my reading. I had read enough that when I started writing it, I didn't embarrass myself -- I had a pretty good idea of what the genre was. But during the years when I was talking sci-fi with friends who also worked at The Ensign Magazine -- Jay Parry, Lane Johnson -- and writing some of my earliest short stories and novels in the field, my pleasure reading was C.S. Forester's Horatio Hornblower series, Ross MacDonald's Lew Archer mysteries, Gore Vidal's historical novels, the quirky, wonderful novels of James Kirkwood, Jr., especially Good Times/Bad Times, William Goldman's Boys and Girls Together, along with I, Claudius and Claudius the God by Robert Graves, and, above all, Mary Renault's brilliant Greek novels. There was some sci-fi thrown into the mix, of course -- I was catching up on Larry Niven's writing, and Harlan Ellison's collections and anthologies were a writing course in themselves. What finally occurred to me was this: a great story, an undying story, is not the specific performance of it in the writer's original text. The immortal part of a story is the aspect of it that can be translated. Nobody today speak's Chaucer's English as their native language -- we read him almost entirely in translation. In grad school, I did learn to read Middle English with some fluency, but I had already fallen in love with Chaucer from the translations. And Shakespeare, even though his language has jagged power and fluid beauty, depending on the play and the scene, wrote in a version of English far removed from our own -- even though, technically, it was "modern" English. Well-prepared by a lifetime immersed in the King James Version of the Bible, I read Shakespeare enough to be able to read smoothly and with understanding -- but Shakespeare's plays are beloved in many languages, so gorgeous as his language was, that was not what made his plays so transcendent. But if it isn't the language, it certainly isn't the plot. I knew from my life in theatre that the "plot" really boils down to who is on stage at any given time -- who enters and who exits. Plot is rather like a wiring diagram. It's not the immortal part of a fictional work. Characters? We certainly love them, when a story works. Well, usually. But when I tried to figure out what made characters immortal in readers' minds, that answer kept slipping just out of reach, too. What makes a good story good is embedded in the "plain tale" -- the step-by-step account of what happens and why. Gradually, over 35 years of teaching fiction writing, I've come to realize that the essence of story is why. Now, this may be a quirk of English-language fiction, starting when English literature first started. Along with this, I came to realize that the essence of characters, the aspect that makes us care about them as deeply as if they were real people that we know well, has nothing to do with description. It is only revealed in the way characters treat each other; it's all in the relationships -- and, of course, the motives and causes behind the things that the characters do. 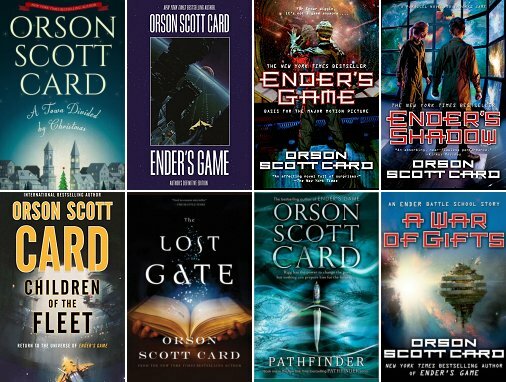 I spent years trying to write a screen adaptation of my novel Ender's Game, but the character of Ender -- without which there is no movie -- was maddeningly elusive. I tried to find him in the relationships with his family, with his teachers, and with one or another of his fellow students, but he kept slipping away. Finally, in the last version I wrote -- which was never read by anybody associated with the movie outside of my inner circle: Lynn Hendee, Aaron Johnston, and my wife -- I nailed it. Ender Wiggin existed in his relationship with all the other children in Battle School. The reason readers loved Ender Wiggin was because he always acted to help other students do their best, and never tried to advance his own "career" at all. He took great risks and suffered severe consequences, but he never wavered in his reliability. And that's what made him a great military commander. His tactics and strategies were quite good, but it wasn't "genius" that made him great -- it was the fact that his soldiers knew that he would never waste them, that he would never use them up in order to advance his own standing or reputation. Instead, he knew his soldiers and used them wisely, effectively, and well. And that's why Ender's Game is recommended reading in several military organizations. Every nation's military is constantly dogged by the problem of careerism, and thousands of soldiers throughout history have died because their commanders only knew how to climb, not how to lead. 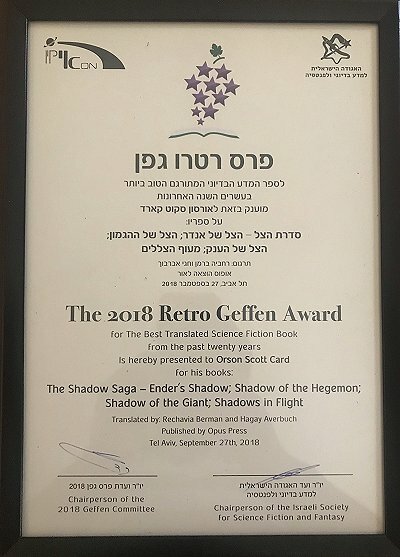 So when junior officers are encouraged to read Ender's Game, it's because of those translatable aspects of the story: What happens and why; what Ender Wiggin chooses to do, and why. Here's the thing: I didn't write Ender's Game with any such plan in mind -- if I had, I would have known how to write the screenplay from the start. When I'm actually creating a story that works, it comes out of my unconscious: Things happen in the book because they come to mind, and they feel important and true to me. That's not inspiration. There's no muse. There's just intense concentration and a willingness to draw story elements out of my unconscious and pour them onto the page using whatever language feels right at the time. It turns out that I do have a distinctive writing style, but I only found that out fairly late in my writing career, when some perceptive critics pointed out my "style." But that only meant that I tried to tone down the quirks that they noticed, because the last thing I ever want is for readers to notice my performance -- the way I write. I want my readers to be caught up in the plain tale. I want them to be concerned about my characters and the things they're trying to do. If they ever notice my style, it means I've lost them. A noticed style is a literary failure, as far as I'm concerned. I try to be, not invisible, but unnoticed by the readers while they're reading. In those early days, when I was trying to figure all this out, I didn't rely on my own fiction to show me what good storytelling is. Instead, because I was writing in the science fiction genre, I plunged into reading what my contemporaries were publishing. Back in the late 1970s and early 1980s, I found Science Fiction Review, edited by Richard E. Geis, to be a good home for my critical writing. After a few book reviews, I proposed to Geis that I wanted to read every short story, novelet, and novella published in the genre magazines and anthologies, and then review all of them that I thought were worth talking about. The result was that for a couple of years, my column in Geis's SFR reviewed, usually briefly, most of the short fiction published in the professional sci-fi magazines. And I read all of it. But after a few years of reading everything, I burned out. It became almost impossible for me to enjoy reading sci-fi. Three paragraphs in, I would start thinking, Oh, she's telling this kind of story, and she chose to use this approach instead of that one. That kind of recognition is fine for chess experts -- Aha, the Queen's Knight Defense! -- but in chess you don't expect to be moved. When I found that I could no longer read the stories like a natural reader, I stopped writing the column. Who cares what a jaded critic thinks? I could only review it as long as I was still a real reader. I figured that after a few years, I'd recover from my overdose and be able to enjoy sci-fi again. But ... no such luck. Nowadays, I don't even try to read a new sci-fi novel, even by friends, even by my favorite writers, unless a lot of friends have assured me that it's something special. That's how I ended up reading The Martian, by Andy Weir. It even extended to movies. That's why I never saw Interstellar and I avoided Gravity, Avatar, and a lot of other sci-fi movies until I couldn't escape them any longer. My taste in sci-fi film runs to surrealism rather than space stuff -- Being John Malkovich and Donnie Darko rather than another iteration of long-worn-out franchises. So here I am, 2,000 words into this column, and I'm finally getting to my point. Here it is: I don't read much science fiction, and when I do, I usually don't like it enough to review it. I'm going to tell you about a pair of science fiction novels that satisfied this jaded old reader's very high standards. Yes, that's right. In order to offer you a short review of an exceptional series of science fiction books, I really did spend about eight manuscript pages on explaining what I mean by a "good story" with "good characters," and why I know what I'm talking about when it comes to science fiction. I was asked to read this book -- or, rather, listen to the audiobook -- in order to see if I wanted to give a positive comment that might be used to promote volume 3 in the series. I rarely accept such requests, but the publisher really seemed to believe in the book and, as long as they understood that if I didn't really like it, there'd be no quote, why not? I would listen to it during my three-hour commutes to and from Buena Vista, Virginia, and I would always have another audiobook to switch to if I didn't care for it. The title Hell Divers really wasn't promising. I was well aware of the American dive bomber that went by the name Helldiver (SB2C), which was noted for having folding wings so that two of them could fit on a World War II aircraft carrier elevator. But I don't actually enjoy much military fiction. People get the crazy idea that I'm a "military fiction" writer, but I'm not. So I assumed that Hell Divers had something to do with war in the air. Hell Divers opens two centuries after a devastating war made the surface of Earth uninhabitable. Sunshine doesn't reach the surface. There are near-permanent electrical storms hovering over the areas where the most important cities were heavily nuked. The only surviving humans live on two airships -- lighter-than-air floating cities that hold about five hundred people each. They are large enough to have onboard farms, and because they run on nuclear power, they don't need to refuel very often. The trouble is that these airships were designed to stay aloft for years at a time. But not two hundred years. If they ever land, they won't be taking off again, because by now they're held together with shoelaces and bubble gum. They send the Hell Divers -- men and women who dive from tubes in the airship, open their parachutes fairly close to the ground, and go scavenging. When it's time to return to the airship, they inflate helium balloons and rise to where they can enter the bottom of the ship. At least, that's how it's supposed to work. But two centuries of scavenging long since used up the easy-to-find, safe-to-get-to supplies. Now they have to dive into "red zones," the most radioactive ruined cities. Even with protective suits, they can't stay long in these areas, so the missions have to be done in haste. Oh, but it's worse. It seems that there are a few creatures that somehow adapted to live in the high-radiation environment -- most dangerously, the "sirens," flying creatures that are nothing but killing machines. The attrition rate is kind of scary, so it's a good thing that dives to the surface aren't very common. Our hero is X -- Xavier Rodrigues -- who is a Hell Diver on the ship known as "The Hive." Because of the unhealthy conditions on the airship, cancer is endemic, and X's wife died fairly recently. In fact, everybody's life has been touched by death. They just go on as best they can. But there are friendships and attachments, and X has a special connection with Tin, the pre-teen son of a couple who were best friends with X and his wife. Their relationship is at the heart of the shipboard story; but down on the surface, it's about the Hell Divers in their constant struggle to accomplish their mission without getting killed by the sirens. Now, to me the whole post-apocalyptic thing is old, and I found plenty of things wrong with the science. Some of the problems are reasonably resolved if you read far enough; some of them never are, and it doesn't matter. The thing is, to quote Johnny Carson, "You buy the premise, you buy the bit." Because if you reject nonsense science, there won't be much sci-fi left to read. We all take liberties in order to tell the story. But this only works if it's a good story, and here's where Nicholas Sansbury Smith really shines. The action writing is very good. It's always clear what's going on, even though the weapons, the enemies, and the settings are all unfamiliar. It's easy for constant fighting can become tedious, like a videogame where you just can't get off a particularly boring level. But Smith manages to keep it fresh and alive. I kept imagining Tom Cruise or Dwayne Johnson playing the part of X -- or of Weaver, a survivor from the crash of another airship, who miraculously stays alive on the surface until he encounters a team from The Hive. Smith is a good enough writer to know that "nonstop action" is unreadable. We have to have interludes in which we come to know the characters and see their relationships when they aren't plummeting through electrical storms toward the hostile surface of Earth or fighting off deadly predators on land and in the air. The commander of The Hive has been hoping to find a habitable spot on Earth where she can set down the ship and people can emerge and live on land again. The airship was not engineered to last this long; someday it's going to fail, and probably sooner than later. I kept anticipating that discovery and that move -- but after a while, we readers begin to understand what the Hell Divers know: There's nowhere left on Earth where human life can reestablish itself. Does this sound depressing? Not really -- it sounds desperate, which means that the Hell Divers know that they have to succeed in their missions, because if they can't recover the needed fuel and parts, the human race will end with the crash of The Hive. If an audiobook isn't very good, it doesn't do its job of keeping me awake on a long drive. So let's just say that while listening to Hell Divers and its sequel, Hell Divers II: Ghosts, I never had to stop and take a nap in order to keep on driving. In fact, when I arrived at my destination, I kept running the car for a while while I finished the chapter I was on. I didn't want to leave the story. I cared about these characters. A lot of ugly things happen to people in these books. Bad things happen to good people. Good people have to do things that aren't particularly good. Running through both books are several mysteries that aren't yet resolved by the end. In fact, I'll be surprised if the third book is able to wrap everything up. Maybe! But I'm along for the whole ride. I'm impatient for the mid-May release of the third book in the series. R.C. Bray's narration on the Blackstone audiobooks is the kind of low-key performance that suits intense action perfectly. If the jeopardy and fighting, tactics and desperate situations are well written, the last thing you want is for the narrator to sound all excited and energetic. The excitement is in the story we're imagining in our heads; we don't need the narrator to read it in an excited or exciting voice. Bray hits exactly the right tone for a gripping adventure story. Your brain has to work harder to read sci-fi than any other genre, mostly because along with the story, you're constantly constructing and reconstructing the world in which it takes place. As the characters learn things that explain where these radiation-loving predators came from, things take on a lot of different meanings. Meanwhile, in volume 2, we find out some things about how The Hive is being run, and we begin to hope there'll be some kind of revolution. So the real shock at the end of the second book is that the Hell Diver team that is in open rebellion against the captain of the Hive finds a way to survive that doesn't involve returning to an airship that might not let them back in. So how can you guess whether you'll like these books? There's a lot of danger and shooting and killing and dying. But there are also a lot of human relationships and political maneuvering and mysteries and discoveries. I was surprised how much I cared. And I was pleased that Smith really knows how to deliver a powerful story. 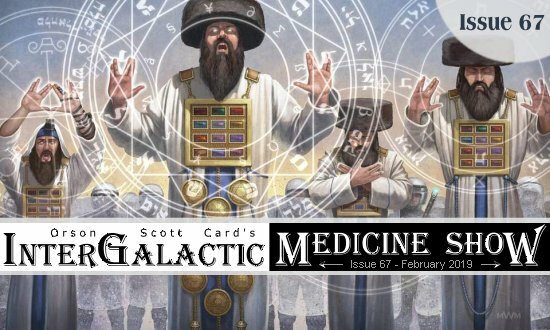 Now, after you've read it, I might want to sit down with you to discuss the scientific problems I had with the story -- and with the ways that Smith partly or mostly dealt with most of them. We might also commiserate with each other about characters we were really invested in, who meet a dire outcome. But a book doesn't have to be perfect to be a powerful experience. At least, I hope so, since I've never written a perfect book, but I sure hope my readers are forgiving enough to receive the story that I'm trying to deliver. I didn't have to do a lot of forgiving to enjoy Nicholas Sansbury Smith's first-rate storytelling. So now I'm going to do something completely weird. This semester I'm teaching a course that includes leading students through discussions of some of my own fiction. This has required me to reread some of my fiction, and I have to tell you, that isn't always easy. That's because as a writer I learn things from one book to the next, so when I go back to something I wrote five or ten or twenty years ago, I can't help but notice choices I made that I would certainly do differently today. Early in my career, I began to rewrite some of my first books, until my wife finally pointed out that I really wouldn't have much of a career if I kept rewriting the same five books over and over. So I now approach my earlier work with the attitude that each novel is the best I could do at the time, with a story that I believed in and cared about ... and still do. I sometimes compare novel-writing to architecture. Architects have to live with a very public display of all their mistakes -- and all their achievements. I imagine that architects look at even their best buildings and notice things that they wish they had handled differently. But heck, if the building is still standing, and still being used, then they did something right. Still, after going over several of my fantasy novels for the past couple of weeks, I needed to get a dose of something completely different. So I listened to my novel Pastwatch: The Redemption of Christopher Columbus. Stefan Rudnicki and his team of narrators did a superb job of reading this very difficult science fiction novel, and because it's sci-fi, I didn't have to think about the issues that come up in fantasy fiction -- like magic systems and mythical creatures. Here's the surprise. This old building of mine -- I wrote it more than twenty years ago -- kept surprising me by not being embarrassing. In fact, it had been so long since I last looked at it that I experienced it rather like a new reader would. I had forgotten most of the details, so as events unfolded, I found myself getting involved with the story, with the people, with the ideas, as if it hadn't been me who thought it all up in the first place. Many of the issues that novel dealt with are even more pertinent today than they were back in the 1990s. And I think my depiction of Christopher Columbus is still about as accurate a picture of the man and his times as I've seen. So apparently, whatever happened in the history where Columbus didn't discover America was so awful that the time travelers who could make only one change decided to send him to America! So how can this new set of time travelers change things without reverting to the very same awfulness that the other guys felt the need to change? That's what the macro-story is about -- but it's really the highly personal story of people trying to find a way to do the "right thing," without being able to know in advance all the consequences of their choices. And even though we only time-travel in one direction -- forward, at the rate of one second per second -- we also make all our decisions and take all our actions without knowing what the consequences are going to be. So to me, as a reader and as an author, it isn't enough just to develop the premise of the story. I have to care about the people. I have to care about their plans and how they work out. You have no idea what a relief it was to experience that book as a reader who didn't know the details of the story as I went along. I know that some of my novels -- Lost Boys, Magic Street, Enchantment -- have very emotional endings. But I was not prepared to be so emotionally involved in Pastwatch. It's kind of a relief to discover, as an old man, that something I built years ago is still standing, and is rather better than I thought it was at the time, instead of worse. I know, this sounds as if I'm reviewing my own book, and I suppose I am -- but the very fact that I allow my books to be published is a kind of a rave review. If I thought they stank, I wouldn't turn them in to the publisher. In that sense, every writer reviews their own books. What I'm actually reporting on is the experience of meeting my younger self as a stranger, a kind of time travel. This is the book I wrote then, I had to realize, and now, after all these years, I realized: I don't have to wish I could hide this one. I'm glad it's there. I'm glad it's still in print. It was worth doing. And when you're old, that kind of thing matters to you. Looking back on your life and thinking, Did I do that OK? You ask this about your marriage, your child-rearing, your career, your friendships, and -- if you're in the construction business, as I am -- about the things you built. 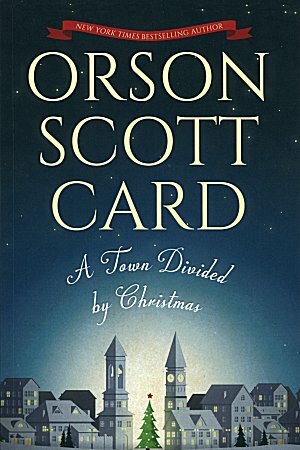 In fact, my biggest discovery while listening to Pastwatch was this: If somebody wants to figure out who I am from reading my fiction, this is the novel that reveals the kinds of things I care about most. It's the closest I'll ever come to a utopian vision, not of the future, but of an alternate past. So in the midst of my semester of introspection, you get a column this week that's all about me. But hey, if you weren't interested, you could have stopped after the first few paragraphs. And at least you got my rave review of Hell Divers, so it wasn't all about me.